Sell your way out of problems you encounter. Are you short on cash? Are you struggling financially? Sell! When faced with financial adversity, individuals who are not in the sales profession are forced to cut costs or work additional over-time or part-time hours, if such work can be found. They are not likely to generate a significant infusion of cash in a short period of time. Salespeople, on the other hand, have that opportunity. If you double your sales efforts for a short period of time, your income will rise proportionately. Statistically, if you generate 1 sale every 20 calls, you know you will generate 2 sales if you make 40 calls. You can generate 3 sales if you make 60 calls. How much income do you generate per sale? Let’s say it is $ 2,500. You are financially struggling to the tune of $ 4,000. You need two additional sales to eliminate that financial burden. That’s 40 additional calls. When can you find time for 40 additional calls? Can you cut out your golf game this week? Can you chat in the office a little less about the weather for a few days? Can you make phone calls while you drive in the car instead of listening to music? Salespeople have opportunities to overcome their financial hardships in a short time span unlike any other profession. Double or triple your effort this week! Incorporating or forming an LLC is typically the first step an entrepreneur will take in starting a business. It makes perfect sense. Forming an entity can help you secure a name, gain liability protection and position yourself for tax benefits. In addition, you need the entity and EIN before you open a bank account, enter into contracts, hire employees and so on. Here at Direct Incorporation, we help the entire spectrum of entrepreneurs set up corporations and LLCs. Our client list includes truck drivers, dentists, software developers, online retailers, salons and every other type of business you could think of but after more than a decade in business, our largest client base continues to be accountants. Accountants use our service to help incorporate and form entities for their clients because we make the process fast and hassle-free. Most of our accountant clients have incorporated businesses before, and know perfectly well how to do it. They choose to have us take care of the process to save them valuable time and money. We can also do it anonymously, as our structure allows for accountants to produce a quality product for their clients quickly without the clients ever knowing that Direct Incorporation exists. Another desirable aspect of our service is our reasonable, transparent fees, which gives accountants the ability to offer what they need to their clients, with the option to mark up the fee they charge for a greater profit. We are a one-stop-shop for everything your clients need to start their business, including the management of legal documents and forms, website hosting, trademark protection, domain name registration, logo design services. The incorporation packages range from $139 to $773 + the state fee (see below for details). If you have clients who might need to incorporate or form an LLC and you are interested in saving time and money, get started by calling us at 877 281 6496 or entering a free business name search for your client here. 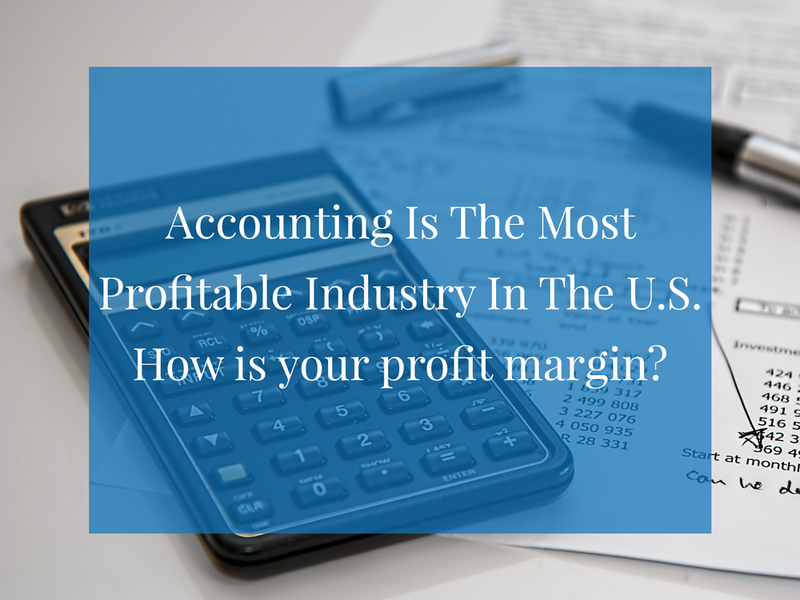 Accounting is the Most Profitable Industry in the U.S.; How is Your Profit Margin? A recent article written up by Mary Ellen Biery, a Research Specialist at Sageworks, says that based on their research the privately held accounting and tax profession has the highest profit margin of any industry in the country. “Companies in these three do-it-for-you industries generate net profit margins, on average, that exceed 15 percent, which is more than twice the average for all industries, according to Sageworks' financial statement analysis of privately held companies…Accounting, tax preparation, bookkeeping and payroll services firms generated an average net profit margin of 19.6 percent. This industry includes…offices of Certified Public Accountants and tax preparers, who typically generate even higher margins than the category average…” So for CPA and tax firms the profit margin is exceeding 20% in part because your type of business has less overhead costs compared with other industries but more importantly it’s just a very valuable service that every company needs to succeed. This is not a new phenomenon either, “Many of the industries were repeats from previous years' rankings. For example, firms that provide accounting, tax preparation, bookkeeping and payroll services have been atop the list for the last several years.” The reason I bring all this up is because this means you and your business should be absolutely thriving. The numbers bear that out. For those of you who are not thriving my question, why? You are in the most profitable industry in the United States (according to this research) so why are you not a raging success? The opportunity is clearly there, so what is holding you back from achieving the success so many of your peers are enjoying? The answer is simple, it’s marketing (or lack thereof.) So if you are seeing these statistics and getting frustrated because they don’t represent your reality then you really need to call NCI today. We can help you gain the competitive edge you need to realize exceptional, nation-leading profits through the power of an excellent marketing program designed, tested and proven for your specific industry and needs. Our marketing programs will show you how to identify and connect with a profitable and ubiquitous target market and how to get in front of business owners who have a need for your services. Then we’ll show you step-by-step how to present your services in a desirable way, how to overcome the most common objections you will hear during this process and how to price our specifically designed package of accounting services fairly and accurately during the initial meeting. If that sounds like too much work (and it is a lot of work) then we also have our Plan 2 program to take the vast majority of that off of your plate and into the hands of capable marketing professionals, interviewed, hired and trained right at your office by one of NCI’s Senior Account Executives. So there are no excuses for you to not be living the life you dream about. You’re already halfway there! You picked the right industry and the right skill set to make a great living. The final piece of the puzzle, if you’re struggling or want more, is a good marketing plan. NCI offers just that. We’ve helped thousands of accountants, EAs and CPAs across the country for over 30 years and now it’s your turn. Call 1-800-338-0778 today to speak with one of our representatives so we can learn about where you are in business now and where you want to be in the near future, then we’ll help you get there. Sageworks is a financial information company that provides loan portfolio and risk management solutions to financial institutions and financial analysis and valuation applications to accounting firms and private companies. The total value for the client over 10 years is $39,050. If this one client refers you only one client during their 10 year life span, a very likely outcome, you double that value and reach a total of $78,100 from that initial small business client. That puts small business clients in a whole new light. Now let’s assume NCI can show you how to obtain only 30 of these business clients over a one year period. That represents $1,171,500 in value to your business over the next 10 years. If you were to reach the projected growth for our Plan 2 Client Acquisition Program at the end of one year, 80 clients, the 10 year value on them is $3,124,000. Too often we hear about the negatives some people assign to the small business client. When you break down the long term value of these loyal clients, things don’t look quite so small over the long run. Call us at 1-888-639-2543 to discuss how we can help you build a lot of value in your practice through the small business market, a market that makes up over 80% of the entire business marketplace. In a recent poll of 530 accounting and financial services firms conducted by The Hinge Research Institute, the number one business challenge they face is attracting and developing new business. 70.5% of respondents cited this as their top concern heading into 2015. From the article: “Cited by over 70% of respondents, attracting and developing new business is the top challenge for accounting and financial services firms. This is in line with a trend across the professional services industries. In many market segments, it’s growing more and more challenging to generate new clients. The competition is fierce. If you find yourself in a similar position I have some good news. New Clients Inc. can help you find a wealth of local business client opportunities in a variety of different ways. Our marketing programs and methods have been fine-tuned over 30+ years to deliver the single most effective way to generate new business in the accounting field. Through a combination of goal setting, lead generation over the phone and internet, and a sales presentation custom tailored to the accounting profession, we can help you reach new heights with your accounting firm in 2015. We can deliver this marketing system to you in one of several ways. We have a live three day seminar multiple times a year in different parts of the country. We also have an online and home study version of that seminar. If you want to really take things to the next level we have a hands-on program (referred to as Plan 2) where we come to your office to hire and train a small marketing team to generate new accounting and bookkeeping work for your firm on a weekly basis. All of our marketing programs include billings increase guarantees and we have hundreds of amazing success stories that prove our programs work. You can watch video testimonials from some of our clients here. Call NCI today to find out how we can help you overcome the number one challenge your competitors are dealing with. Competition in this industry is fierce and we can give you the competitive edge you need to be a success. Call 1-888-NEW-CLIENTS (1-888-639-2543) for additional information and to get your questions answered. If you’re interested in learning the other four challenges cited by the study, head over to the original article. Chris is the oldest son of NCI CEO and founder, Bruce Clark. He graduated with a Bachelor’s degree from Loyola Marymount University in Los Angeles, CA in 2005. He has worked for New Clients since April 2006 filling a variety of roles including Senior Account Executive, client support specialist, editor of and contributor to the NCI newsletter, New Client News, appointment setter evaluator, seminar presenter on web and email marketing, and playing the prospective client during seminar role play sessions. Chris also helped Bruce edit his first book, The NCI Effect which came out in 2011. In his leisure time Chris is an avid reader of fiction, graphic novels and the internet. He enjoys film, video games, science and technology. He lives with his wife Kathy and their two dogs Charlie and Daisy, in Southern New Jersey.